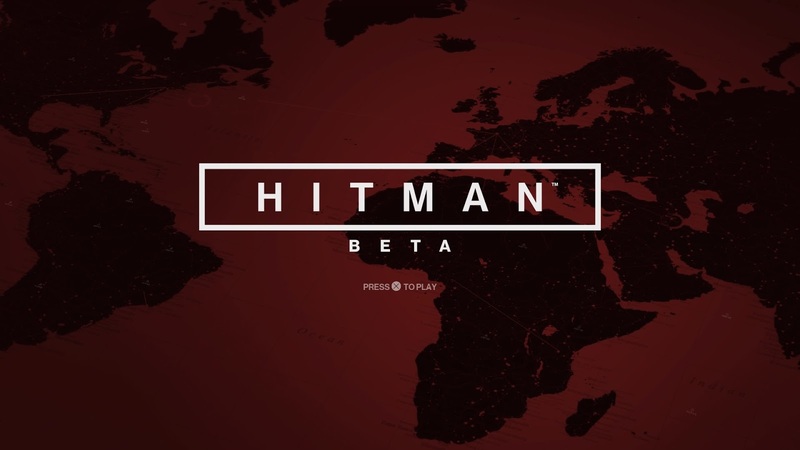 Had the chance to try out the Hitman Beta the other day! Early previews seem to be praising this game and even the developers look very excited for this game. 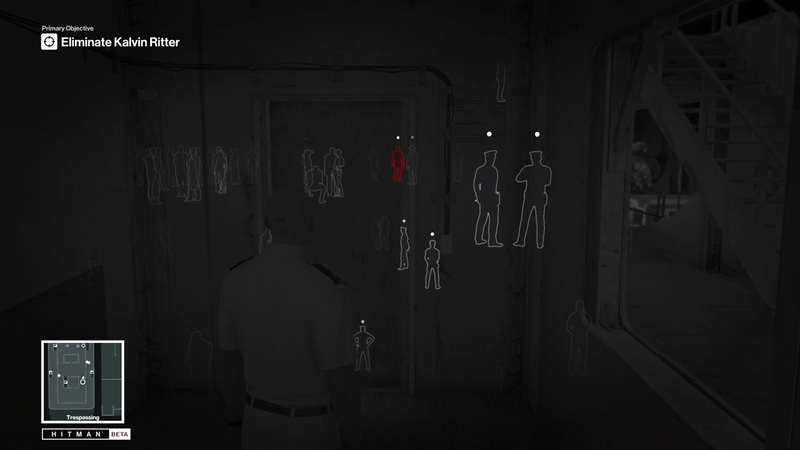 I have never played any of the Hitman games before, so really I wanted to get a feel with this, before making my decision. Here's the first 45 mins which includes the tutorials and a couple of fail attempts.. Starting off the beta was a short introductory scene followed by the tutorial... which came in very handy, giving me step-by-step instructions on how I should take down my target and a general feel of the game. Wearing certain suits act as disguises, which will either allow or prevent me access via certain entrances/routes. So, to access different areas of the map, I had to look around for different disguises that I can use to my advantage. For example, I took out a mechanic and took on that disguise to access the maintenance area without raising the alarm. Agent 47 also has a ability - 'Instinct', which works very similarly to Eagle Vision in the Assassin's Creed games. With the ability to see silhouettes through walls, I could track my target and look for other uniformed personnel whose suits/disguises I could use. Once I infiltrated the yacht under the mechanic disguise, I found another 'suit lender' to disguise myself as a cabin crew. This way, I could get much closer to my target and listen to his conversations. The conversations can be interesting, with a little backstory on the different characters but more importantly, some conversations can also provide clues on possible assassination methods. Under the cabin crew disguise, I was in the bar area where there were drink glasses that I could poison but alas, I didn't have poison in my inventory. This is what they were talking about, that there will be several ways of taking down your target but different decisions in the lead-up will give you access to different tools and weapons. 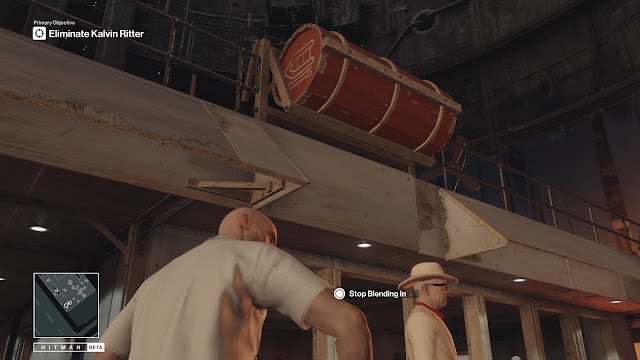 Also saw this barrel conveniently situated above the target, no idea how to make it fall on him though.. So, having lost my opportunity to poison my target, I followed him and his client to his office. Once again, there were limitations to the areas I could access with the current disguise so I sneaked around to the back where I had a clear shot at my target. Took him down and I had to go! 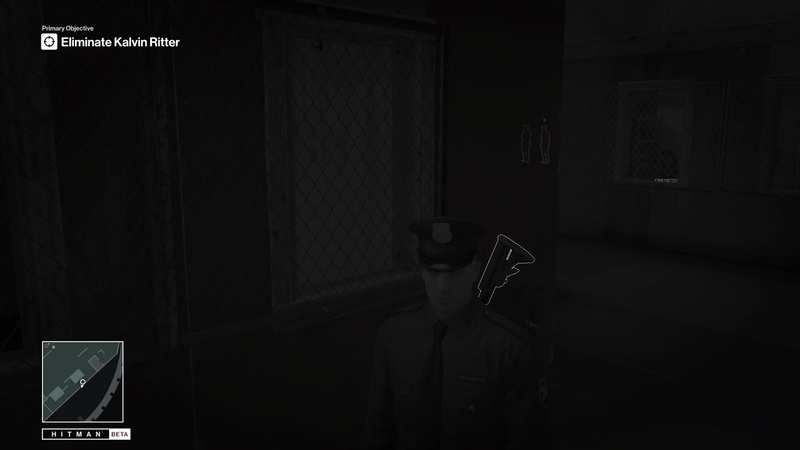 Certain crew members could see through your current disguise and they are labelled with a white circle over their heads. The main stairs off the yacht was blocked by 1 such crew member so I had to take the long route out. However, found out later that this could have been avoided with another change of disguise. Following the tutorial steps, I managed to get out and complete my first mission. Looked pretty easy. Upon completion, I noticed a tab which showed several Challenges. Under this Challenges tab, I could view clues regarding the different methods of assassinations I could have used, together with the different disguises/tools available. Pretty cool, but I told myself and I would strongly urge other players not to view this page before trying the missions out by yourself. From the tutorial missions, I feel that part of the fun, is to genuinely explore the map without the clues and try out the different methods and look for the clues on your own. Look around at objects & people, try different routes, listen to the conversations and Be a real Hitman. Too often, we gamers try to complete a game quickly & easily that we lose the experience of enjoying a game for what it is. Given the episodic release of this game, I think it suits the nature of the game where as a player, I'm not bombarded with a dozen missions and try to complete each mission as fast as possible so that I can progress to the next mission. Given more time on each mission, I believe I will enjoy the exploration and using trial and error to take out my target like a true Hitman. Here's a few more videos.. In this successful attempt, I entered and exited the yacht via the main stairs using the Security disguise. Of course, not before failing miserably in a previous attempt.. I wanted to see how well I could do in a non-stealthy approach and went all guns blazing.. After a painful shootout, I managed to get out in 1 piece.. Though it made things a lot tougher, it was great knowing that I could take a very different approach and still complete the mission. It did look a lot emptier inside the yacht itself after I took out most of the guards on the outside. The beta was an enjoyable experience of the tutorials, giving a good feel of the game. 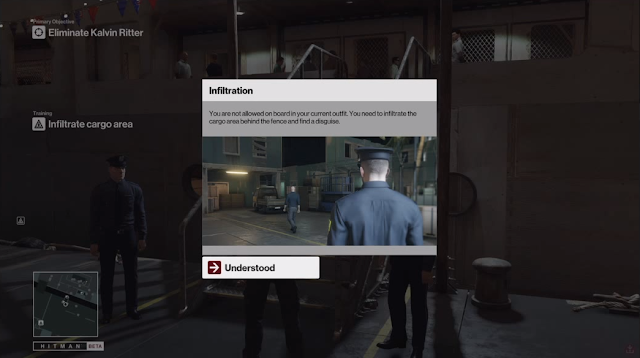 Outside of the tutorials, you won't get on-screen instructions on where to go or what to do. So, it will be a true open-world map. I like that it didn't have visual clues to guide me too much. It was cool having to explore the different options on my own. A lot of it was having to use trial and error. From the beta experience, I get the feel that the game would be a truly sandbox experience, where I, as a player, can fully control the actions and route my character takes, to complete an assassination. I liked what I saw, so I have pre-ordered the Collectors Edition!